Join us for an all-new program this fall! 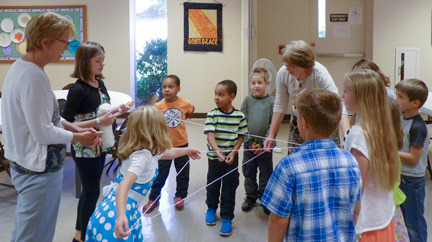 Children’s Sunday School is open to members and visitors. Ages: Pre-School through Middle School (age 3 through the 8th grade). Dates: Begins September 17, ends May 20. Important Dates: There are a few Sundays where Sunday School will NOT be held. These mostly coincide with holiday/public school breaks. Time: Sundays, 9:30 a.m. – 10:20 a.m.
Children ages three and up are invited to enjoy simple songs, Bible stories, crafts, games, and more in a friendly, nurturing environment. The goal of the Sunday School program is to provide children with the basic foundations upon which to build their Christian faith. A team of dedicated teachers takes turns teaching the students, who are divided into small groups by age and grade. 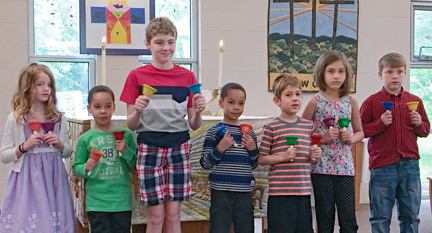 Throughout the program, students will find ways to support their favorite social causes, perform in a Christmas pageant, participate in a children’s handbell choir, and form lasting friendships as they learn about God. Families are invited to join their children during Sunday School on the first Sunday of each month for Jesus and Pancakes. Families will help prepare and enjoy a meal together, during which the pastor will lead a brief kid-friendly church service. It is helpful to the teachers for parents to take their little ones to the bathroom before class, as teachers can not send a child alone to the bathroom. IMPORTANT: If your child is in 2nd grade or younger then you MUST sign them in/out of class, per our Youth Protection Policy pdf. Each class will have a sign in/out sheet available. Your children will need you to pick them up at 10:20 a.m..